↑ "Phanerozoic". Oxford Dictionaries. Oxford University Press. Retrieved 2016-01-20. ↑ Cohen, K.M. ; Finney, S.C.; Gibbard, P.L. ; Fan, J.-X. (2013). 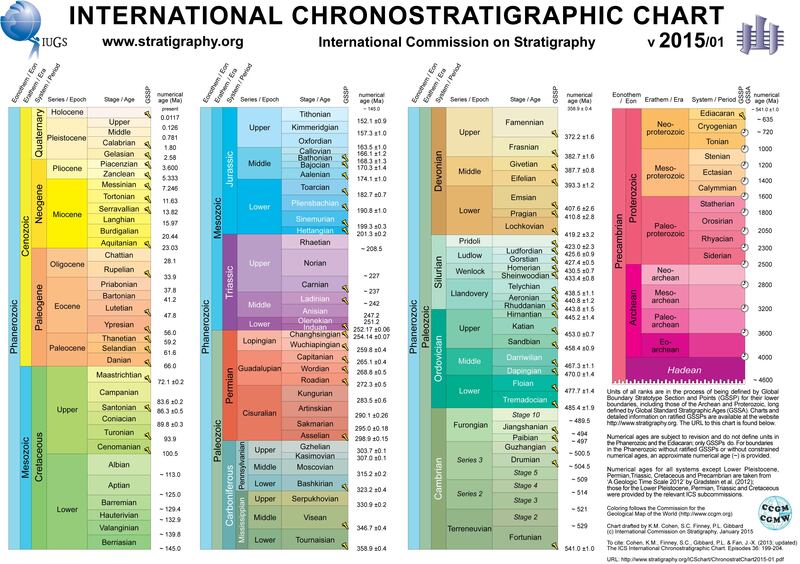 "International Chronostratigraphic Chart v 2015/01" (PDF). Episodes 36: 199-204. International Commission on Stratigraphy. Retrieved 2015-11-26. ↑ "Phanerozoic Eon | geochronology". Encyclopedia Britannica. Retrieved 2018-03-16. ↑ University of California. "Paleozoic". University of California. ↑ University of California. "Cambrian". University of California. ↑ University of California. "Ordovician". University of California. ↑ University of California. "Silurian". University of California. ↑ University of California. "Devonian". University of California. ↑ Monte Hieb. "Carboniferous Era". unknown. ↑ University of California. 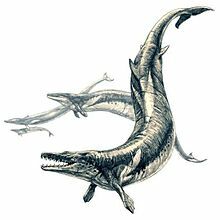 "Carboniferous". University of California. ↑ Natural History Museum. "The Great Dying". Natural History Museum. ↑ University of California. "Permian Era". University of California. ↑ Alan Logan. "Triassic". University of New Brunswick. ↑ Alan Kazlev. "Early Triassic". unknown. Archived from the original on 2015-04-27. ↑ Rubidge. "Middle Triassic". unknown. ↑ Graham Ryder; David Fastovsky & Stefan Gartner. "Late Triassic Extinction". Geological Society of America. ↑ Enchanted Learning. "Late Triassic life". Enchanted Learning. ↑ ক খ গ ঘ Carol Marie Tang. "Jurassic Era". California Academy of Sciences. ↑ Alan Kazlev. "Early Jurassic". unknown. ↑ Enchanted Learning. "Middle Jurassic". Enchanted Learning. ↑ Bob Strauss. "Cretaceous sauropods". author. ↑ ক খ গ Carl Fred Koch. "Cretaceous". Old Dominion University. ↑ University of California. "Cretaceous". University of California. ↑ Elizabeth Howell. "K-T Extinction event". Universe Today. ↑ Encyclopædia Britannica. "Paleocene". Encyclopædia Britannica. ↑ University of California. "Eocene Epoch". University of California. ↑ University of California. "Eocene Climate". University of California. ↑ National Geographic Society. "Eocene". National Geographic. ↑ University of California. "Oligocene". University of California. ↑ Encyclopædia Britannica. "Neogene". Encyclopædia Britannica. ↑ University of California. "Miocene". University of California. ↑ University of California. "Pliocene". University of California. ↑ Jonathan Adams. 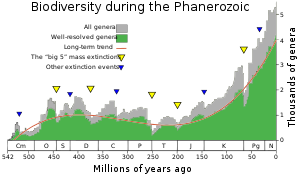 "Pliocene climate". Oak Ridge National Library. Archived from the original on 2015-02-25. ↑ University of California. "Pleistocene". University of California. ↑ University of California. "Holocene". University of California. ↑ Scientific American. "Sixth Extinction extinctions". Scientific American. ↑ IUCN. "Sixth Extinction". IUCN. ↑ ক খ See, e. g., Markov, A.; Korotayev, A. (2008). "Hyperbolic growth of marine and continental biodiversity through the Phanerozoic and community evolution". Zhurnal Obshchei Biologii (Journal of General Biology). 69 (3): 175–194. উৎস: (2015/01)। International Commission on Stratigraphy. Retrieved 13 July 2015. Divisions of Geologic Time—Major Chronostratigraphic and Geochronologic Units USGS Retrieved 10 March 2013.